Sammy likes to keep me on my toes with all these blue plaid shirts. This one is primarily blue with a simple white and black broad plaid. The plaid on the pockets runs diagonal, and the shirt does up with white snaps. In The Man Who Knew Too Much (6x22), both Soulless!Sam and Hell!Sam wear this shirt in Sam’s mind. 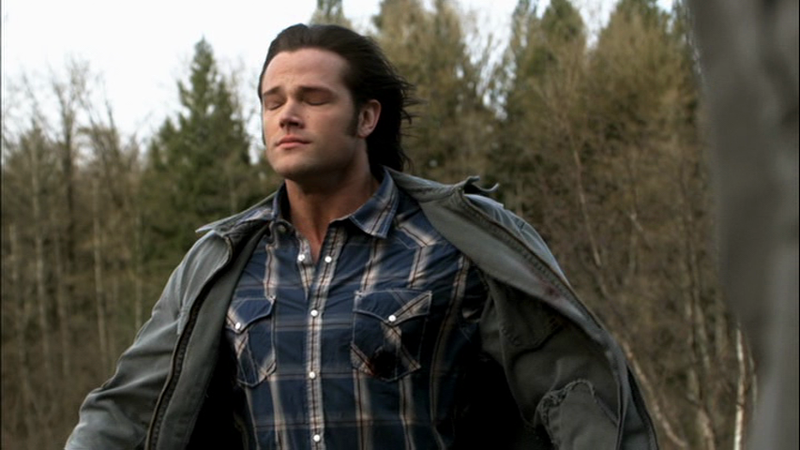 FATE: Sam gets shot in the shoulder and the chest during Swan Song, but the wounds to both his body and his clothing appear to be mended when we see him at the end of the episode. Someone else was speculating about this shirt in 6.13 when Sam has his hell flashback at the end and is on fire--they were trying to figure out if the shirt in the flashback was this one even though he had on a different shirt when he passed out. Yes, as far as I can tell (given the quality of my download of that episode), the shirt in his flashback was the shirt he fell into hell wearing, and not the shirt that he was wearing when he had the flashback (same goes for the jacket). Here is the shirt that goes with Evil Sam's two snap green jacket. Damn now I am going to pay more attention to there clothes than I already do. Oh I remember people trying to find out if it was the shirt/jacket he fell into hell with too. A continuinity they actually picked up on lol. I'm impressed. Evil jacket is it? Since both Lucy and Soulless Sam wore it? Is it just me or does this look like a blue version of Sam's Grey Stripey Plaid Shirt? Hmm, why yes, it does! I really have to get on the ball with identifying the brands of Sam's clothes so that mysteries like this can be solved! I had wanted to search out more brand info for Sam's shirts, but I just never seem to have the time, so I really appreciate it!